How does the questions limited to the scope of a nightly build of a ROM are helpful to site in long-run? expected to have bugs which may or may not be severe, but in any case it is expected that users report bugs whenever encountered so that the latter gets fixed ASAP before a stable build for all end-users is released. What long-term benefit does the site have from those questions? Is there a problem you also see or have I exaggerated the issue? As the title asks, what do you recommend for dealing with such questions, other than commenting? Do note that nightly builds are updated at a faster pace. Possibility of a solution for a bug in a next release is also high if developer is aware of the issue. Once the next build fixes the issue, the question loses almost all of its usefulness. This reminds me of the problem with shopping recommendations where the information definitely becomes obsolete in a matter of few months, if not weeks as in case of nightly builds here. I noticed that the criteria of automatic deletion of a question isn't much helpful here. I think you're right that these questions add no value to the site. They're almost never fixable by users, and we do seem to get a lot of them. 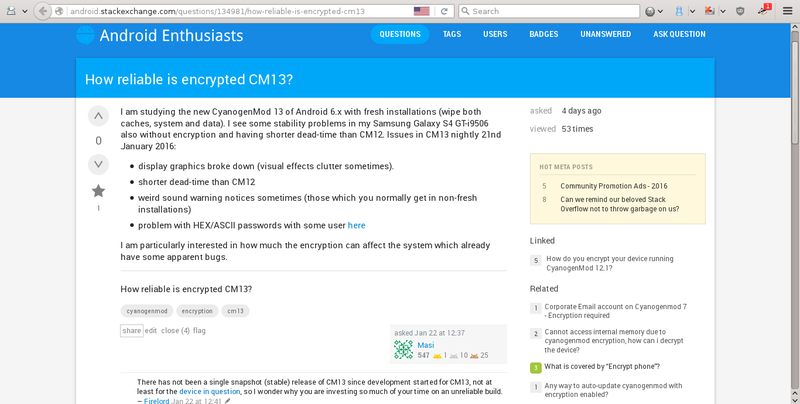 I've tried to reduce their number in the past by adding to the cyanogenmod tag-wiki a note about nightlies and about how to get bugs fixed faster; also by adding a comment like "don't use nightlies" to such questions. I'd be in favour of a "canonical" CW question of the form "I have problems using a nightly/unstable build of this ROM; what can I do about it? ", with an answer that (a) suggests how to report bugs, and how to help out mod authors in other ways, and (b) tells you not to use nightlies on a phone you actually want to use. All these questions would be duped to this canonical question. I'd even be happy to write the question and answer, if the community agrees with this solution. I agree that there is little value in questions that are specific to a nightly ROM builds. I think it would be a good idea to have a policy of closing such questions. We want questions (and answers) for the "long tail", not questions (and answers) which are only helpful to the Asker in the here-and-now. To that end, a canonical question and answer here on Meta Android (similar, perhaps, to this question on the Uber Meta) would be useful. It should specifically call out the reasons why such questions aren't allowed (already well-delineated in Firelord's question). A ROM should have a stable, public build before it becomes a valid topic here. If there is a ROM where a "beta" is as stable as most other ROMs "final" release, such an exception could be mentioned here. Another canonical question and answer on the main site could be titled "I'm having trouble with a daily ROM build. What do I do?" The answer could explain why such questions are off-topic (with a link to the Meta question I mentioned above), issues need to be forwarded on to the ROM maker, and then list the major ROMs and their bug-reporting mechanisms. In this case, 'prevention is better than cure'. On Stackoverflow, upon trying to submit a question, the editor is smart enough to realize there's more code snippets than text. With that approach in mind, how about, upon asking the question, expressions like 'Unstable', 'Nightly', 'CyanogenMod' (or other custom ROMs with nightlies) in same sentence/paragraph are flagged, then a prompt appears pointing the asker to learn more about questions relating to nighlies. I think its much easier stopping them in their tracks with such a hint. With that prompt, should an asker proceed to post nightlies related question(s), it becomes obvious the post needs to be deleted, and should be.